The National Commission on Certification of Physician Assistants (NCCPA) offers the Physician Assistant National Certifying Exam (PANCE) for certification purposes. Candidates must meet specific academic eligibility requirements before taking this test. 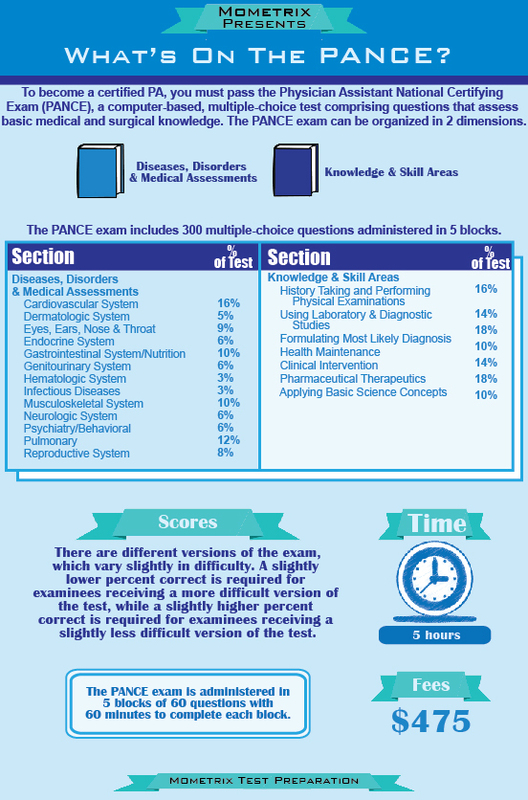 The PANCE test computer-based assessment includes 360 multiple-choice items. The PANCE test lasts six hours. Candidates will be given 45 minutes for breaks which they must personally manage between blocks of test items. Breaks used during a block of questions are not deducted from break time; instead, the minutes come out of the testing time for that block. There is a clock on the test. There are six blocks of questions to complete, and candidates will have one hour for each. Candidates can only go back to change or review questions in the block they are working on at the time, and cannot go back to any other section. Organ systems – This includes diseases, disorders and medical assessments that candidates would need to understand in each of the systems. Disease – Comprehension and ability that candidates must have in order to deal with diseases, disorders and assessments. The following organ systems are included on this test (percentages of the test questions are approximate). There may be others on the test as well. They are as follows: cardiovascular (16%); pulmonary (12%); endocrine (6%); eyes, ears, nose and throat (9%); gastrointestinal and nutritional (10%); genitourinary (6%); musculoskeletal (10%); reproductive (8%); neurological (6%); psychiatry and behavioral (6%); dermatologic (5%); hematologic (3%); and infectious diseases (3%). The raw score (the number answered correctly) will be converted to a scaled score in a 200-800 range. The minimum passing scaled score needed to pass is 500. After passing, candidates may use the title of Physician Assistant-Certified or the acronym PA-C after their name as long as the certification is up to date. If a candidate needs to take the test again, he or she will have to wait 90 days. This exam can only be attempted three times in one year. 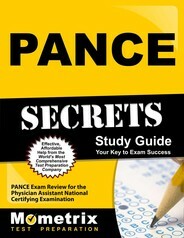 Ace the PANCE test using our PANCE exam study guide with practice questions. 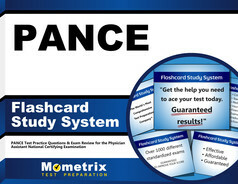 Quickly Solve Difficult PANCE Test Questions with the PANCE Flashcard Study System.